Enzymes are well-suited for use in residential and commercial swimming pools. And we pool professionals recommend enzymes because they are a naturally based option. These products have evolved over the years to include specific varieties that meet the needs of individual bodies of water. Today, there are two types of enzyme products available for use in pools and spas: blended and broad-spectrum. Both provide visible results, but they work differently based on how they are made. Blended enzymes: These often are blended to focus primarily on reducing fats and oils. They can reduce the time and effort needed to keep the waterline clean in a pool and/or hot tub. Broad-spectrum enzymes: These are made with a fermentation process — similar to how alcohol is made — and are capable of accelerating or catalyzing thousands of chemical reactions in pools and hot tubs. Broad-spectrum enzymes naturally break down non-living organics such as bather waste, lotion, sunscreen and oils. They break down unwanted additions to pool and/or hot tub water piece-by-piece until there is little left, other than water and air. When choosing between the two types of enzymes, keep in mind that the broad-spectrum type tends to have a wider range of capability. Each enzyme bonds with a specific molecule, called a substrate. They meet at the active site, which is where the reaction occurs. After this joining takes place, the substrate is broken apart into smaller pieces that can then continue to deteriorate. 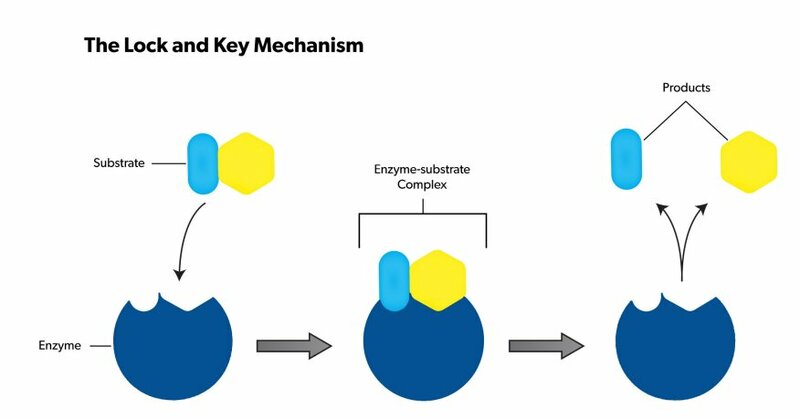 The enzyme then moves onto another, similar substrate to continue the breakdown process. Natural Chemistry Enzymes often are explained through a lock-and-key model as shown above. WHICH ENZYMES SHOULD BE USED? Select an enzyme product based on the body of water for which it was formulated. For example, a spa can have somewhat different needs than a swimming pool. These hot-water vessels deal almost entirely in bather wastes, such as makeup, hair products and lotions. Enzymes formulated for these bodies of water are meant to target the most commonly experienced non-living organic waste that builds up in spa water. They also are buffered to last longer in the warmer water environment of a hot tub. Swimming pools also contain non-living organics such as bather waste, lotion and sunscreen, in addition to the environmental factors that can affect pool maintenance. These can include pollen (with especially high amounts in the springtime), as well as bird waste and even jet fuel dropped by planes landing in the area. For this reason, it’s important not to use the same enzymes in hot tubs and pools. They also should not be interchanged, because enzymes formulated for pools are not designed to work in the higher temperatures of hot tub water. Using enzymes in the wrong application could hinder their performance. Enzymes are specific as to what they break down, so it’s important to have a broad spectrum variety capable of catalyzing thousands of reactions. The enzyme that’s effective on pollen, for example, will not be effective on sunscreen and vice versa. A broad spectrum enzyme allows for maximum coverage and the treatment of a wide variety of non-living organic waste in pools and spas. It is a commonly accepted standard in the industry that each bather leaves behind about 16 ounces of non-living waste in 45-60 minutes in a body of water. Enzymes can and really should be used primarily as a maintenance product in addition to the regular sanitizer and balancing efforts. Enzyme maintenance products are formulated to be applied in weekly doses, which are different for pools and spas. In commercial pools, enzymes can be placed on a metered feed, so the pool gets a small amount seven days a week. After non-living organics are broken down by the enzymes, the filter doesn’t need to work as hard to remove them. The enzymes work while bathers are swimming, it is like cleaning up in the heat of the party. Non-living organics are broken down as they are added to the water, rather than after they’ve built up and caused issues with the filter, water clarity, or at the waterline. Enzymes also can be used to help in cases of vandalism or an accident. They can even break down motor oil.